Being a parent of young children is all about deciding which parts of the world you let in now and which you keep out as long as possible. News? Out. There is no good news. News is meant to depress people. But Sunday morning comics is in. Comics are meant to make you laugh. Hannah Montana? No. Phineas and Ferb? Yes. Pro wrestling? Not hardly. But baseball can always provide both quality entertainment and much education. This applies to all things spiritual as well. God and Jesus and angels are definitely in, but the darker side of theology goes unmentioned. My kids don’t know what hell is. Or demons. They don’t understand that there are some people in this world who hate their faith and them for having it. The world is a nasty place. I figure part of my job for now is to do all I can to keep that nastiness away. They’ll find out about it all sooner or later. The question caught me by surprise. If hell and demons were temporarily off limits, then certainly Satan was, too. Seven-year-olds have fantastic imaginations. Having the thought of a horned and pitchfork-tailed demon rolling around in her mind would make for some long nights. But what could I tell her? That Satan is the embodiment of evil? That he is darkness so thick that you had to brush it away with a hand? That he is a fallen angel who prowls the earth in search of souls to murder? “The Bible says he’s a liar,” I told her. I decided not to pursue that last little bit of information and instead file it away for later. I really wanted to know what she had lied about. “But he’s the worst liar ever,” I said. “I know God loves me, Daddy,” she said. I opened my mouth to answer, and then closed it. What’s the second biggest lie? I had no idea. I’d never really thought about it. To me, there had always been the first and then the rest. Ranking them beyond that seemed a little unnecessary. But as I sat there and stared into her eyes, I thought about my life and all the lies I had been told. And then I thought about the lies we’ve all been told. The best falsehoods are the ones that aren’t told to us as much as they are felt by us. One we accept as truth because that’s what the evidence states. Those we fall for every time. It’s easy to lose sight of who we are. Our mistakes and regrets are piled upon one another as a monument to our failure. Stacked high up, blocking the sun. And the Son. It’s hard to see the light when you’re standing in your own shadow. We carry so much, don’t we? So much knowledge of not only what we’ve done, but what we’re capable of doing. That bad in us is so much easier to see than the good. We dwell upon the depths to which we can plumb but never give thought to the heights to which we can ascend. There is a holy spark within us all. The thumbprint of the Almighty is stamped upon our hearts. There is a righteous power within us all to rise above where and who we are to become better and more. Too often we limp through our days when we should walk upright, all because we deny the great truth of our existence—we are more than we appear. I tucked her beneath the blankets and kissed her forehead. 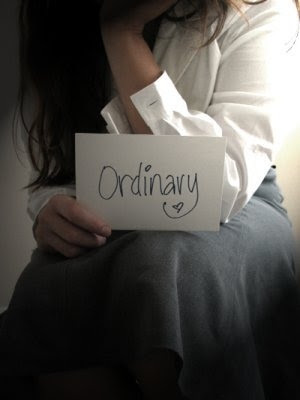 “That we are all ordinary,” I said.